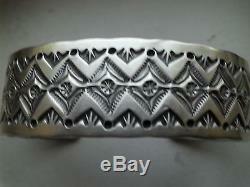 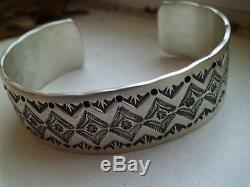 This is a classic Navajo stamped Sterling bracelet in a relatively wide width showing an intricate combination of stampwork that exemplifies the symmetry of a steady-handed, experienced silversmith. 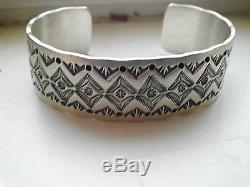 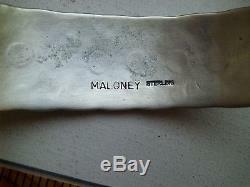 This cuff is made from ingot Sterling in the old-fashioned manner. 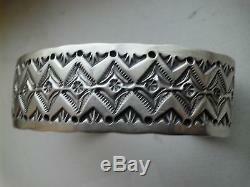 This cuff was made by Leonard Maloney. 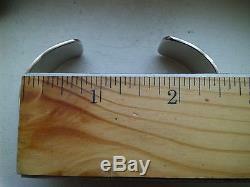 It measures 6 inside with an inch gap. 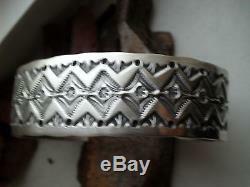 1 wide with rounded ends. 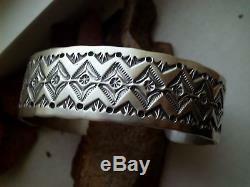 Although this is a heavy cuff it remains very flexible to make it larger or smaller. 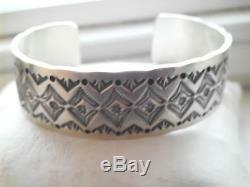 This cuff weighs 47.9 grms. 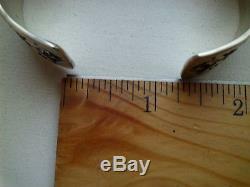 2 1/2" across with a little over 1" gap.